In July, the Allspan team were tasked with installing a special airshow temporary event structure in the impressive landscaped grounds of Farnborough Business Park – the original site of the Farnborough Airfield. Recognised for setting the standards in outdoor spaces, the Business Park provides an array of green areas and award-winning landscapes and is home to national and international companies providing a range of amenities, including hotel and conference facilities, retail and leisure. 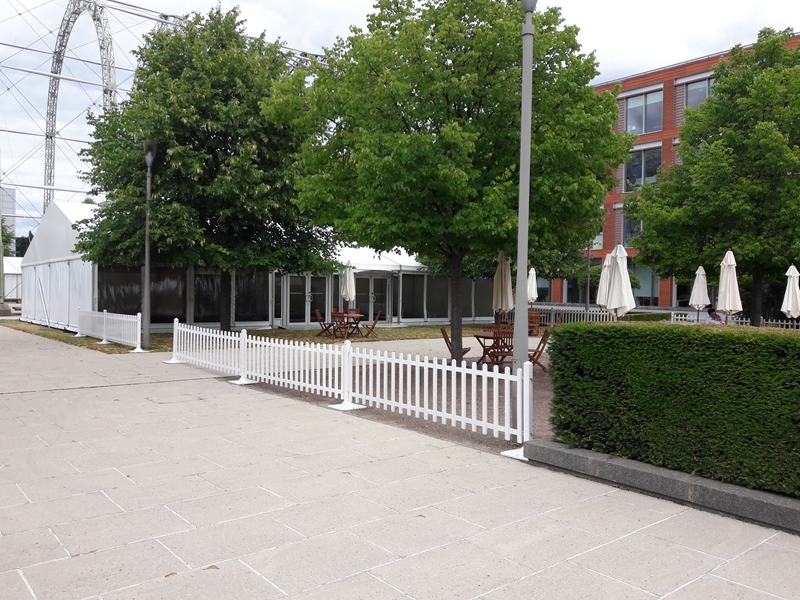 We were delighted to set up our temporary event structure on the Business Park’s Heritage Square, ahead of the International Farnborough Airshow, which was to take place nearby at the exhibition and conference facilities. Our stylish marquee structure was hired by Judge Events for a number of events during the week and was installed next to the park’s dramatic centrepiece – a restored portable airship hanger which sits proudly in the middle of the award-winning business park. The original hangar dates back to before the First World War and was designed for lightness so that it could be taken down and relocated with relative ease – much like the thinking behind our very own temporary event structures! With the event taking place during the airshow weekend, it was a huge benefit to have the temporary structure as a way of being able to offer the best of both worlds – amazing views of the action in the skies – whilst encouraging people to socialise and be in the company of others from across the park’s different buildings. The event structure was used to offer space for a range of hospitality events and worked well in situ around the dramatic airship hanger, allowing people to dip in and out of each space and mingle freely, thus creating a celebratory atmosphere under the thrilling skies above. Allspan’s event structure provided fantastic views on to the surrounding outdoor spaces of the park. Boasting an array of impressive buildings, Farnborough Business Park was a superb setting for our temporary event structure. The location also highlighted how adaptable our event structures are in a corporate setting. 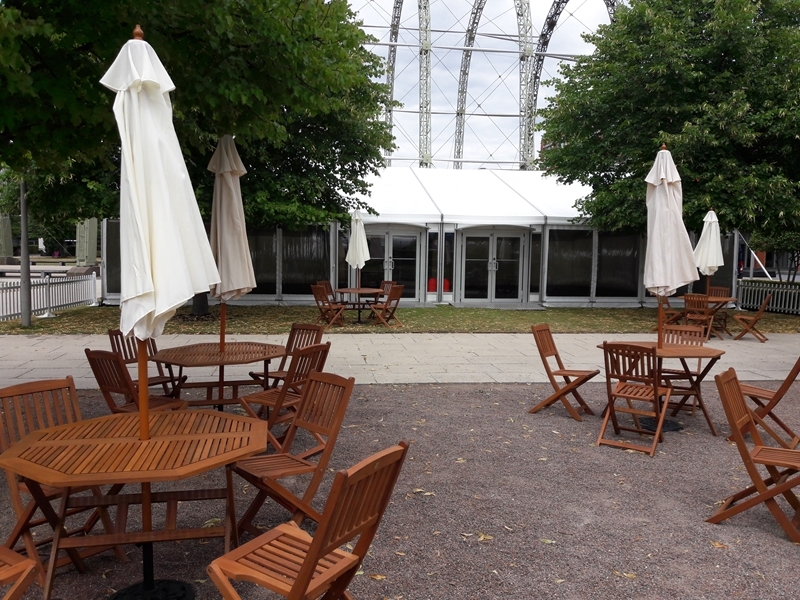 Temporary structures are a great way of providing clients with an extension of space to their own building and gardens. Fortunately the weather was impeccable, but for the park’s event organisers it meant that come rain or shine, the event would be unaffected. The Allspan temporary structure installed at Farnborough Business Park was a 12m wide x 18m Losberger Frame Marquee with a self-weighted levelled Cassette Floor and Anthracite Needlecord Carpet. The interior was lined with flat ivory roof and wall linings. We also provided a 4.5m wide x 12m Catering structure, again with a self-weighted cassette floor, and an anti-slip cater floor covering. We also provided the exterior furniture, toilet facilities and a generator courtesy of our trusted suppliers. The Farnborough International Airshow brings together the biggest players in the global aerospace industry, as well as being an awesome public event that attracts people from far afield. Being able to adapt to different event environments is something we are extremely experienced and proud of. It is one of the many reasons we are asked to return year after year by clients who want reliable event structures that enhance the setting in which they are needed. As part of Allspan’s event marquee hire service in London, Kent, Surrey and Sussex, the client is able to specify the size, finish and furnishings of the structure. Allspan structures can also come with a cassette floor system that provides a secure levelled footing for guests which can also be extended outside to create a sophisticated wrap-around veranda or terrace if needed. Unlike a permanent venue, the options for building the ideal temporary structure are endless and working with Judge Events and the team at Farnborough Business Park has been a great opportunity to showcase our diverse offering. If you would like to find out how we can work with you on your corporate or private event, talk to our friendly team, who can advise on Allspan’s structures and marquee hire services. Call 01474 850550 to find out more.